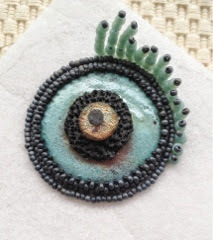 I was lucky enough to take a class with Anne Marie Desaulniers at beadFX on Intuitive Bead Embroidery in early March. 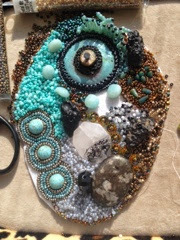 I have done bead embroidery before and even taught classes in the basic of peyote bezelling a cabochon, but this class opened up a whole new world to me. 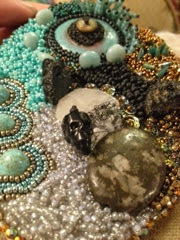 A world of freedom with beads. 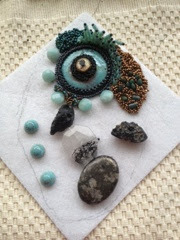 The permission to play with beads, a needle and thread in a whole to way. 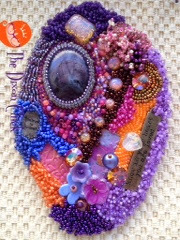 The freedom to express myself, my thoughts and feelings through bead embroidery. This is the piece that I started during the class that just had to come out. I think it is very representative of who am I. Bright, happy, exuberant with just a little darkness. 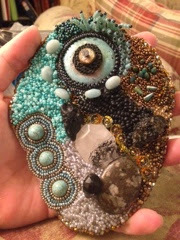 I have been accepted in to Robin Atkins' Bead Journal Project on Facebook. Thank you, Robin, for providing a safe and supportive environment for my explorations. 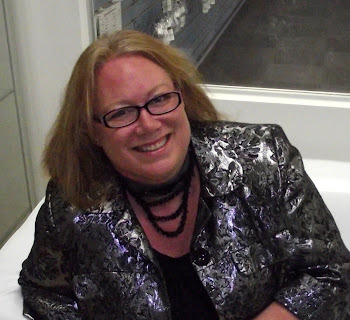 Your comments on my pieces and the comments of other members has made me realize that I have found my voice. Thank you all for the encouragement. The second piece I made in March (cause I can't stop!) represents my head injury. In December, we had a bout of very bad weather here in Toronto, including a vicious ice storm. On Friday nights, my husband plays hockey with the boys, so I am left to my own devices. I suddenly had a hankering for Haagen Dazs Chocolate Peanut Butter ice cream. If you haven't tried it, well, don't. You will have a new addiction!! I laced up my winter boots, bundled myself up and got set for the 5 minute walk to the store. Sadly, I didn't make it. As I was walking in the driveway of my apartment complex, I slipped on the ice. My feet flew out from underneath me and I ended up flat on my back and smacked my head of the pavement. My glasses went flying. I just lay there looking up to the heavens completely discombobulated wondering how did I get here? I was helped up by a gentleman who was slipping and sliding his way over to me. Needless to say, the ice cream would have to wait. I dragged myself back upstairs and got undressed to inspect the damages. One bruised ego and a whole lot of soreness. I grabbed some ice and started a wee pity party. Home alone. No ice cream. And a lot of pain and stiffness. I beat myself up for being such a dingbat. Well, the hustle and bustle of Christmas and New Year's came and went along with more bad weather. It wasn't until the second week of January that I started getting these excruciating headaches. It was as if someone was pulling my ponytail really hard and jamming a screwdriver into the top of my head at the same time. I headed over to the emergency department at my local hospital. I was seen pretty quickly as head injuries are not something to mess with. After a series of tests and answering lots of questions, I was told I had suffered a concussion and now has post concussive syndrome. What?!?! Post-concussion syndrome, also known aspostconcussive syndrome or PCS, is a set of symptoms that may continue for weeks, months, or occasionally a year or more after aconcussion – a mild form of traumatic brain injury (TBI) ~ from Wikipedia. I was shocked to say the least. I was ordered to have immediate bed rest and not work. Not only that, but as I needed to "rest" my brain, I was banned from all sources of visual stimulation. No TV. No computer. No iPhone. No beading or crochet. No reading. It was horrible. I am still suffering from cognitive disfunction, occasionally vertigo, and headaches. Ugh. 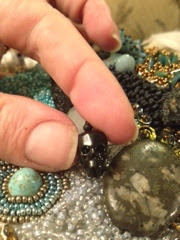 In my BJP piece, I chose a cabochon made by Maku Studios to represent the head injury. A nail in the centre sums it up! 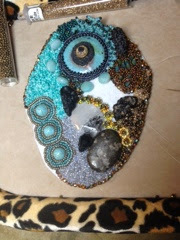 I just started beading and it began to take on a life of its own. - a routilated quartz that represents the ice. It all looks pretty, but is not quite right, which pretty much sums up me at the moment. See the circles on the left? They don't meet properly. 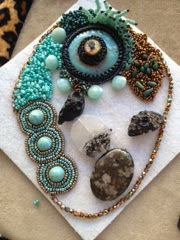 See the baby spike beads? They aren't laying properly. The mint green and the white opal colour combos represent the ice. The coolness of winter. There is some brown times in the lower right hand corner to suggest the colours of my beloved ice cream. I will get better. It just takes time. If you know someone who has a brain injury, be kind and patient with them. Certainly don't reprimand them. It really does amaze me how some people don't seem to understand that I've has a traumatic brain injury. If you bang your head or fall and smack your head, seek medical attention immediately. It's not something to be dismissed. Just think of poor Natasha Richardson, Liam Neeson's wife. Bumped her head while skiing. Was fine, talking to people. And then she was gone. I'm sorry to learn of your injury. I wish you all the best and a speedy recovery. I think both your pieces are admirable, telling their very own story. You have said something true there, and it can't be said loud enough: Do not mess around with head injury, see that you get to the emergency ward immediately, whatever the time of night or day, and don't put off getting rest, rest, rest!